Scarlet Tanagers are medium-sized songbirds that spend their summers in the Eastern United States. They have bright plumage but are actually hard to find since they spend their time singing high up in the tree tops. Male Scarlet Tanagers are brilliant red with black wings and females are greenish-yellow with olive wings. Tanagers are finch-like with thick bills, stocky bodies, and short tails. In the fall, males molt to look more like the females, but retain their black wings. Long-distant migrant. Summer (breeding): Eastern United States. Migration: Southeastern United States, the Caribbean Islands, and parts of Central America. Winter: South America. Mainly deciduous forests, sometimes pine-oak woods or coniferous woods. Scarlet Tanagers prefer to breed in oak trees. In the winter they spend time in the tropic rain forest or lowlands near the Andes. Scarlet Tanagers are foliage gleaners who mainly eat insects. They either perch or hover when grabbing insects and will swallow smaller insects whole. They will press larger insects into a branch. They will mainly forage towards the canopy but may also forage on the ground. Males will display their contrasting colors to the female by standing on a branch below her and drooping his wings/spreading his tail. Scarlet Tanagers are monogamous during the breeding season but choose new mates each year. Females will build the nest in a deciduous tree on a horizontal branch that is usually away from the trunk. Scarlet Tanagers have 1 brood per year with the average clutch size of 3-5 eggs. The female will incubate the eggs for 12-14 days and chicks will be fed by both parents (but mainly the female). The chick will fledge 9-15 days after hatching, but will be cared for by the parents for about 2 weeks after fledging. A repetitive, hurried warble. Many people say that a Scarlet Tanager sounds like an American Robin that has a sore throat. Scarlet Tanagers migrate mainly at night and fly across the Gulf of Mexico to reach their breeding and wintering grounds. Scarlet Tanagers sometimes fall victim to Cowbird parisitism. If the Tanagers sees the female Brown-headed Cowbird approaching they will attack it to keep it away. However, if the Cowbird is not spotted, it will throw out the Tanager’s egg and replace it with their own. The Tanager cannot tell that it is not their egg and will unknowingly raise the Cowbird chick. They are one of the few birds where the female also sings. She can answer the male’s song similarly , but in a shorter and softer manner. Scarlet Tanagers are the only North American birds that has the combination of red bodies and black wings. It’s Memorial Day weekend. Although summer doesn’t start until June 20th, many people consider this weekend to be the start of the summer season. In New Jersey, this means that thousands of people make their way to the Jersey Shore each weekend from now until Labor Day. I grew up at the Jersey Shore. The strange thing is though, I barely spent any time at the beach until I became an adult. Once I became a birder and moved away from the shore I realized that there were so many birds that I missed out on growing up. So I try to go to the shore a few times a year to enjoy the beach and the shore birds. Dave and I visited Barnegat Lighthouse State Park on Friday morning. Barnegat Light SP is located on the northern tip of Long Beach Island in the town of Barnegat Light. It’s a great place to see all different kinds of shore birds as well as waterfowl in the winter. Whatever time of the year, Barnegat Lighthouse SP is shore to please (bad pun, I know haha!). It seems like a crazy idea on Memorial Day weekend but we got there early and beat all the crowds. We started our hike by walking along the short pine trail near the visitor entrance. I finally got to see my first Black and White Warbler. Other birds on the trail were Northern Cardinals, a Mourning Dove, Song Sparrows, Yellow Warblers, Gray Catbirds, and American Robins. We continued onto the beach and walked along the jetty towards the end of the beach. The first thing we spotted was a small group of gulls, but there was something else mixed in…a Piping Plover! Piping Plovers are small and blend in perfectly with the sand. They are considered endangered in New Jersey as well as in some of the other states they live in. Human recreation, habitat loss, and predators have all contributed to the decrease in numbers of Piping Plovers over the years. Here in New Jersey we’ve had some good new though. Last year Conserve Wildlife New Jersey reported that the breeding population of Piping Plovers increased from 92 pairs in 2014 to 108 pairs in 2015. On Long Beach Island certain parts of the beach are blocked off to avoid people from interfering with the shorebird’s nests. This Piping Plover was putting on a show. It was rapidly flying through the gulls and running around with its tail feathers down while being chased. Then we spotted it…a chick! The other adult and chick were nearby and this adult was trying to distract the gulls. I have seen Piping Plovers before but this was my first chick! It was so adorable. The Piping Plovers disappeared into the sand, so we continued on our way. There were 5 Semipalmated Plovers resting nearby and 2 Eastern Kingbirds fluttering through the sky. We ran into one of my favorite summer residents: the American Oystercatcher. These birds are so striking to me: medium-sized, black/white/brown bodies, with a long bold orange bill and entrancing red eyes. We saw 3 Oystercatchers, but my favorite was the one towards the end of the jetty. It found an oyster and happily strutted around with it in its bill. It would stop every so often to twist the shell in the sand then continue on its way. We watched it run to a tide pool near the jetty where it finally cracked open the shell to enjoy its snack. Another bird we watched along our walk was the Ruddy Turnstone. A few days after Christmas it was 75 degrees (crazy New Jersey! ), so we went to Barnegat Light and saw our first Ruddy Turnstones. There were a handful of them running around on the jetty in non-breeding plumage that December day. We saw many of them on Friday and finally got to see them live up to their names. They walked around in small flocks, turning over any object that was in the way to find food. They were fun to watch. Towards the end of the jetty we saw some more gulls and Double-crested Cormorants. As we looked out at the ocean a few Ruddy Turnstones and Sanderlings foraged along the coastline. When we were ready to leave we were in for a surprise: a whole mixed flock arrived! There were a mix of about 30 Sanderlings and Ruddy Turnstones running out towards the ocean then being chased back by the waves. And suddenly, they were gone as quickly as they arrived. We saw the same Piping Plover family on our way back towards the lighthouse. There was not one chick though…there were 3! What a wonderful sight! I still can’t believe we were lucky enough to see a whole family of Piping Plovers. I hope through conservation efforts these beautiful plovers and other endangered shorebirds continue to see their populations increase. If you happen to go to the beach this weekend (or know anyone who is) please remember to share the beach with our avian friends. Don’t you want to continue experiencing this cuteness in the years to come? I shore do :-). Time for Migration Monday! Today’s featured migrant is the Indigo Bunting. Indigo Buntings are stocky, finch-like birds that are actually part of the Cardinalidae (or Cardinal) Family. During breeding season male Indigo Buntings are a brilliant blue, with darker blue plumage on their heads, and have a silvery-gray bill . The male’s wings have black plumage. Females are a drab brown with a whitish throat. Females have faint streaking on their breast and some may have a slight touch of blue on their rumps, wings, or tail. Immature male buntings are a patchy blue and brown. In the fall males will molt their blue plumage and become more brown like the female. Indigo Bunting tend to like the edges of habitats: edges of woodlands, roadsides, swamps, and old fields near bushes. They breed in brushy and weedy pastures. Mainly insect, seeds, berries, and buds. Indigo Buntings forage on all levels, from the ground to up in the trees. In the summer they usually forge alone, but form large flocks to forage at their wintering grounds. Upon arrival to their breeding grounds, they may eat on twigs and leaves from various trees. Males will start to defend their territories in the spring by song. A male may have more than one female breeding in his territory at a time. Females will build a nest in a low tree or shrub using twigs, weeds, bark, and other materials to form an open cup. Indigo Buntings may have between 1 and 3 broods per year (usually 2) with a clutch size of 3-4 eggs. The female will incubate the eggs for 11-14 days and nestlings will fledge between 9-12 days after hatching. Sometimes the male will take over care of the young while the female starts a second brood. Males sing a lively and cheerful song of short phrases that are each repeated twice. For example, a song may sound like “what! what! where? where? see it! see it!”. They form what is referred to as “song neighborhoods” because young males will learn songs from other males in their area. As a result, neighboring males will have similar songs and males from a few hundred yards away will have very different songs. Indigo Buntings migrate at night and use the stars to help them navigate. Indigo Buntings, like other blue birds, are not actually blue. Microscopic structures in their feathers refract and reflect blue light. They can migrate around 1,200 miles from their breeding grounds to their wintering grounds. They tend to migrate due south, meaning if an Indigo Bunting breeds in the western part of their range they will migrate to the western part of their wintering grounds and vice versa. Indigo Buntings and their western cousins, the Lazuli Bunting, may share ranges and even interbreed. Male Lazuli Buntings may also learning songs from the Indigo Buntings. Today’s post is Part 2 of our Ithaca, New York birding vacation recap. You can read Part 1, which was our first day at the Cornell Lab of Ornithology, here. I have to admit, there was one thing I was worried about before we left for the trip: weather. The forecast was set to be beautiful for Thursday, but it was supposed to rain all day Friday and Saturday. I was slightly disappointed by the idea of rain because this trip was all about birding and being outdoors. I really treasured our time at the Lab on Thursday because I thought it would be the only day we would be able to walk around there. It did rain on Friday morning. We had a plan though. We spent the morning at the Museum of the Earth. Museum of the Earth is part of the Paleontological Research Institution, whose building is located right next door. If you ever go to Ithaca, New York I recommend visiting the museum. It details the history of Earth spanning 4.5 billion years ago to today. As you walk through the museum you can view thousands of fossils and some cool dioramas. According the the Museum’s website, they take care of 2-3 million specimens. It was a fascinating subject to learn about. We spent more time on Friday exploring the inside of the Lab. I enjoyed seeing the new Wall of Birds Mural in the stairwell. As part of the Lab’s centennial celebration last year, artist Jane Kim and Ink Dwell Studios created “From So Simple A Beginning”. This mural highlights birds evolution and highlights species from all over the world. I was excited to view it because I watched all the live streams and seminars about it while it was being painted. There are paintings throughout the Lab of various birds and a cool hummingbird taxidermy display. We watched the Feeder Cam from above in the Adelson Library and viewed a Mourning Dove nest from an observatory that overlooks the pond. I loved visiting the Cornell Lab of Ornithology and hope to go hiking there again in the future. After lunch Dave and I walked back to Cascadilla Gorge. This time we climbed the 400-foot incline to the Cornell University campus. It is certainly not a walk for everyone (the incline is steep) but it is definitely rewarding. While walking to the Gorge, Dave and I were discussing the Museum of the Earth and fossils. We started to look for fossils and ended up finding them all over the place! In Ithaca and the Finger Lakes region fossils are abundant. They all date from the Ordovician and Devonian periods from 450 to 360 million years ago. The ones we found were mainly clams and crinoids, also known as sea lilies. Dave found a somewhat large piece that looked like a whole small ecosystem that we took with us. It was awesome seeing all the fossils and the breathtaking waterfalls. Saturday was our last day in Ithaca. On the way home we visited Buttermilk Falls State Park. This gorge was definitely “gorge-ous”, just like the slogan “Ithaca is Gorges!” tells us :-). We took the Gorge Trail, which elevates to 450 feet. We did not hike the entire trail but what we did see was spectacular. We ended up finding some small clam and crinoid fossils that we took as souvenirs. Again, we were blessed with lovely weather which we didn’t expect. I’m glad we stopped at Buttermilk Falls on the way home, because it was a wonderful way to end the vacation. I had a wonderful time in Ithaca. I would love to visit the area again to enjoy all the natural beauty in the area. If you are looking to have a vacation that revolves around nature activities I highly recommend staying in Ithaca, New York. Friends, it finally happened. Last weekend Dave and I went on vacation to Ithaca, New York to visit the Cornell Lab of Ornithology. If you’ve been following my blog for awhile, you know that this is a big deal for me. I love the Lab and everything it stands for. I’ve been wanting to visit the Lab for the past few years, so we decided it was finally time. We arrived at the Lab in the early afternoon on Thursday and were blessed with beautiful warm weather. The Lab was just as pretty as it looks from the bird cams and website. We only briefly entered the Lab because there was a seminar of sorts taking place, but we planned on spending more time inside the follow day. The Lab’s Feeder Cam is right outside the visitor’s entrance, but blocked off by pieces of wood so people don’t disturb the feeders. You can see the cam well from the inside of the building. I’ve spent many hours watching the live Feeder Cam on the internet, so it was cool to see it in person. After checking out the feeders we started our walk through Sapsucker Woods. I already had an idea of what Sapsucker Woods Bird Sanctuary looked like from watching Pond Cam on the Lab’s website. It was beautiful experiencing it in person. Sapsucker Woods is 230 acres and comprised of ponds, forests, and ferny swamps. One of the first things we noticed was tons of woodpecker holes. There were woodpecker holes of every size and many of them were made by Pileated Woodpeckers (unfortunately we did not see any Pileated Woodpeckers this trip). We recorded 30 birds on our walk and hiked almost all of the trails. Most of the birds were the usual suspects we would see at home, but seeing them in a new place was exciting. We did add a few new birds to our life list: Yellow-bellied Flycatcher, Black-capped Chickadee (we get Carolinas here), and Wood Thrush. Chipmunks everywhere! Dave and I call them “Chippies”. They were literally everywhere. I think we spent most of the day happily exclaiming, “Look! Another chippie! They are so cute!”. They were not phased by us one bit. We spent most of the afternoon at the Lab before heading into the city to check into our hotel. After dinner we found Cascadilla Gorge. Ithaca is known for having around 150 waterfalls. Their slogan is “Ithaca is Gorges!” (get it? I love the play on words). Cascadilla Gorge Trail is a 400-foot climb that leads to the Cornell University campus. We didn’t hike the trail on our first night, but planned to the following day. We did watch a cute Mallard couple dabbled on the edge on the waterfall. The following video was taken on my iPhone so its not the best quality ever, but they were just so cute dabbling I couldn’t resist sharing. This video is posted on the BirdNation Youtube page. Day 1 of our vacation was fabulous. I was elated that we were finally in Ithaca enjoying all the natural beauty this town had to offer. Check back tomorrow for Part 2, where we return to the Lab and experience some other natural wonders. Hi everyone! I’m back! It’s been about a week, but I have a good excuse for why I’ve been away. I was on vacation fulfilling one of my birding dreams. What might that be you ask? You’ll have to wait and see in tomorrow’s post! Warbling Vireos are small songbirds with white underparts and gray-olive upperparts.They lack wingbars, but have pale lores (the region between the eyes and nostril) and faint yellows flanks on the sides of their breast. They have a black stripe through their eyes and white stripe above their eyes. Don’t let their plain plumage fool you; these birds are anything but dull. Warbling Vireos live up to their names. They sing a rambling song from high in the trees which is their most distinctive and one of their most interesting features. Western Vireos and Eastern Vireos were once considered different species. Warbling Vireos are medium to long-distant migrants, who mainly travel at night. You can find them in the summers breeding in Western Canada and most of the United States, except for the Southeast. They migrate through Texas and Mexico to reach their winter residence of Central America. Deciduous and mixed woods, usually near some source of water. Western populations tend to breed in canyons, prarielands, and trees of mountains. Eastern populations breed in isolated groves with water nearby. In the winter they spend time in mixed flocks throughout open woods. Mainly caterpillars, but eats other insects as well. They will add berries and fruits to their diets in fall and winter. Warbling Vireos are foliage gleaners who search for food high in the treetops. They search methodically on one leaf before moving on to the next. Males will attract females by spreading his wings, fanning his tail, and strutting/hopping around. Female vireos in the east will build their nests high up in trees, while females in the west build them in shrubs or shorter trees. The nest is made up of different plant fibers and bark. Warbling Vireos have 1-2 brood per year with an average clutch size of 4 eggs. Both parents will incubate the eggs for 12-14 days. The male will usually sing while incubating. Warbler Vireos are a species that are frequently parasitized by Brown Cowbirds. When this occurs the vireos will unknowingly raise the cowbird chick as their own. However, some females in Eastern populations have figured out that there is a cowbird egg in their nests. These females will puncture the invading egg and roll it out of the nest. Vireo chicks will fledge from the nest 12-16 eggs after hatching. Males sing a cheerful and dizzying series of notes. The highly-variable songs are approximately 3 seconds long and usually end on a high note. If you want to hear it, check out the sound links on the Cornell Lab of Ornithology’s Warbling Vireo page. The second sound clips sounds like what I heard the other day. You can find the sound clips here. Due to the fact that Warbling Vireos avoid areas that are not unbroken forest, it is believed that their populations are larger than they ever were. Warbling Vireo populations throughout the country are so variable that ornithologists have recognized 6 separate subspecies. Some scientists believe that the Warbling Vireo’s song is partly learned as opposed to instinctual. They believe that their jumbled song is partly due to mistakes in the development process of learning the song. This past Sunday was Mother’s Day. I had a lovely day with my mother and sister. The weather was lovely as well, so we decided to start our celebration with a walk at Amico Island. I heard from one of the internet birding groups that I’m in that there was a heavy migration Saturday night, so I was hopeful for some new migrants. We had a successful day with 28 species in a little over an hour. Our first stop was the blue trail. Towards the beginning of the trail there were two people with cameras. 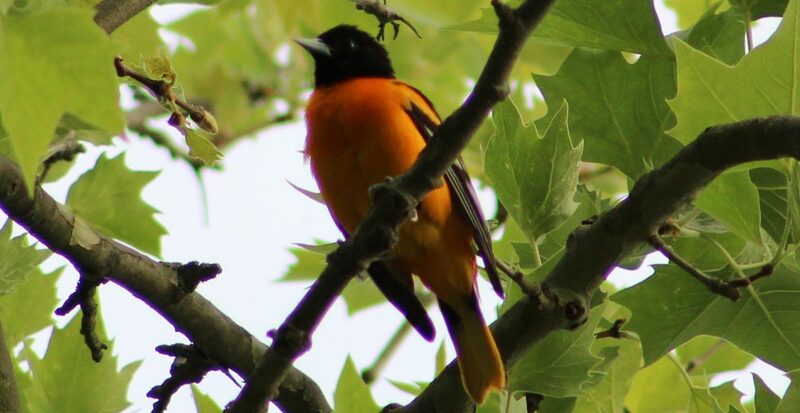 They seemed very excited and they had a reason to be: Baltimore Orioles! There were both males and females present and they were whistling from high in the tree tops. We didn’t know where to look; they seemed to be everywhere! It was really busy in the forest area on the way to the Great Blue Heron rookery. Birds we observed included: Yellow Warblers, Common Yellowthroats, Yellow-rumped Warblers, Carolina Chickadees, Brown-headed Cowbirds, a Carolina Wren, Blue-Gray Gnatcatchers, Grackles, Gray Catbirds, and American Robins to name a few. Below is my favorite picture I took of a Yellow Warbler so far. He looks perfect to me :-). One of my favorite parts of our trip was watching from the rookery observation area. There were some Great Blue Herons in the rookery, as well as some flying around. We also watched a Red-Tailed Hawk soaring and many Tree Swallows. Before leaving I peeked through some branches and spotted a Great Egret (my first of season) and a Great Blue Heron standing side by side. Another Great Blue Heron decided he wanted to join the party too while the egret preened. The Egret wasn’t too thrilled about being stuck between two Great Blue Herons, so he decided he was going to be the leader of the line. They were amusing to watch as they relaxed and preened. We continued towards the beach area on the yellow trail. In the wintertime the beach area on the Delaware River section of the island is usually packed with waterfowl and gulls. This wasn’t the case on Sunday, but we did see some Mallards and Canada Geese. An Osprey flew overhead and was even mobbed by a little bird at one point. We really enjoyed walking at Amico on Sunday. I hope everyone that celebrates Mother’s Day had a great weekend with their families!